Performing annual service for Generac generators under our care, with genuine Generac parts, is critical to ensuring the safe and reliable operation of the standby generator when you need it most. As a Generac authorized service provider, we offer affordable scheduled maintenance, Generac standby generator maintenance, wi-fi monitoring, and extended warranty plans for 8 to 22 kW air cooled Generac, Centurian, and Honeywell generators located in New Jersey. Generac air-cooled backup generators need to be properly maintained to perform as intended. In order to ensure safe and reliable operation, generator maintenance needs to be performed on an annual basis. Regularly maintaining your Generac Generator with genuine Generac parts is key to the performance and reliability you count on when the lights go out. As a Generac authorized sales and service dealer, we developed PowerBase, our Generac generator service plan, to provide a proactive approach to maintaining your Generac standby generator and identify problems that may otherwise go undetected, causing serious damage and potentially costly emergency repairs. This refers to the maintenance & repair aspect of your generator. All 2014 and newer Generac Air Cooled Generators come with a standard 5-year limited warranty. This standard warranty includes the first 2-years of limited comprehensive coverage on miles, labor, and parts; year 3 includes limited comprehensive coverage on parts only; and years 4 and 5 includes limited comprehensive coverage on the engine (short block) and alternator (rotor and stator) parts only. We are able to upgrade you to a 7-year extended warranty if you purchase the upgrade within 12-months of the generator purchase date, which will remain as the start date. We can also upgrade you to a 10-year warranty at any time after the purchase date, which will remain as the start date. Don't worry, if your generator was purchased before 2014, or if your warranty has expired, we can still fix your generator on a time and materials basis. As part of your standby generator maintenance package, we can monitor your generator remotely if Wi-Fi was included when your Generator was installed. Once operational, our team gets notified of the the generator’s Engine Hours, Battery Level and Fault Status via eMail —automatically. * The standard 5-year limited warranty from Generac (included with your generator purchase) includes the first 2-years of limited comprehensive coverage on miles, labor, and parts; year 3 includes limited comprehensive coverage on parts only; and years 4 and 5 includes limited comprehensive coverage on the engine (short block) and alternator (rotor and stator) parts only. ** The 5- and 7-year extended warranty can be purchased within 12 months of the end-user purchase date, which will remain as the start date. The 10-year warranty can be purchased at any time after the end-user purchase date, which will remain as the start date. Unit must be registered and end-user proof of purchase must be available upon request. Available on Generac®, Honeywell®, and Centurion® Air-cooled automatic standby 2014 models and newer. Available on Guardian® and PowerPact. Some exclusions apply. See Generac warranty statement for full details (www.generac.com). *** Basic wi-fi monitoring is provided by generac on all units with the Evolution 2.0 controller. If Wi-Fi is included with the Generator, you will have the ability to view the current status (e.g. ready to run, running due to power outage, running an exercise) of your generator through the MobileLink® portal. **** If Wi-Fi is included with the Generator, you will have the ability to view the current status (e.g. ready to run, running due to power outage, running an exercise) of the Generator. As part of our fleet, we will have the additional ability to remotely manage your generator. This includes the ability to edit the generator settings, received notifications, and view your maintenance schedule, event history, etc. This standby generator service plan is our pay-as-you go program for scheduled maintenance on your Generac generator. This is our value leader... and our most popular standby generator service plan. For a small up-front fee and low monthly payments, we provide a fixed price on 5 years of scheduled maintenance with up to two schedule visits a year. Standard limited warranty for 5 years from the date of Generator Activation. Years 1 and 2 includes parts and labor, year 3 is parts only, and years 4 and 5 cover parts for the short block. 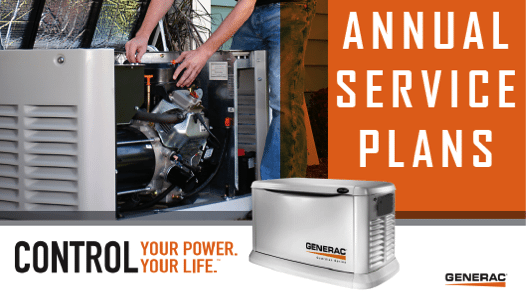 This Generac standby generator maintenance plan provides an extended (parts and labor) warranty for 5, 7 or 10 years plus 5 years of scheduled maintenance. For a reasonable up-front fee and low monthly payments, we also provide a fixed price on 5 years of scheduled maintenance with up to two schedule visits a year. This Generac generator maintenance and service program includes wireless remote monitoring and scheduled maintenance. For a very reasonable up-front fee and low monthly payments, we not only monitor the real time status of your generator, but dispatch a Generac Authorized Service representative if we discover a problem. This is our most complete standby generator service offering and the best way to protect the investment in your new generator for up to 10 years. For a reasonable up-front fee and low monthly payments, we not only monitor the real time status of your generator, but dispatch a Generac Authorized Service representative if we discover a problem.